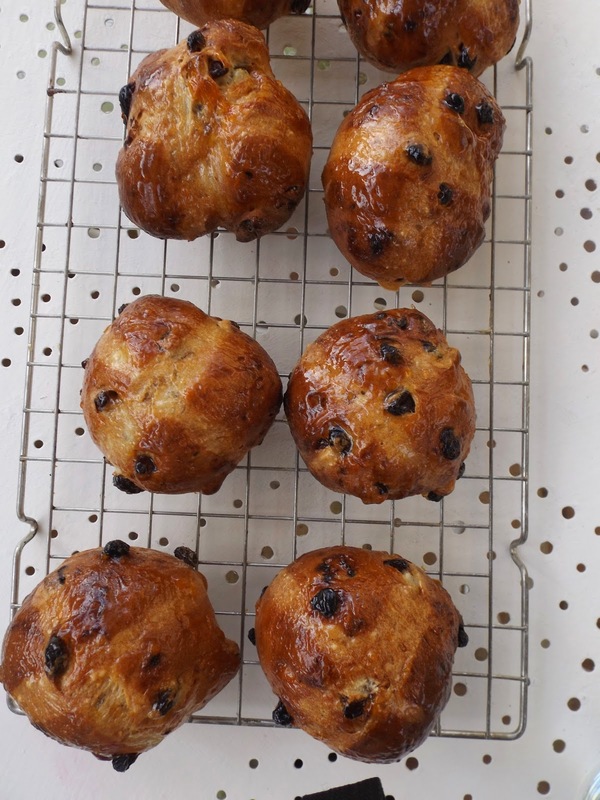 Hot Cross Buns are a delicious seasonal treat. To me they are (should be) seasonal and should be eaten on Good Friday (or during holy week). None of this hot cross buns at Christmas nonsense, they are an Easter, spring time treat. Their availability should be even more limited than mini eggs. Come Easter Monday, or even a good week before, they become like gold dust and impossible to find. This year I wanted to make my own. Of course they wouldn't have the uniformity of shop bought ones, or the nice prominent cross, but at least they would be homemade and I would know exactly what went into them. For the dough, I slightly cheated and made it in the bread maker. This is much easier as the whole process is complete in 2 hours 20 minutes, Otherwise, if you want to make the dough by hand you will need around three hours of proving time. If you have a bread maker just cram all of the ingredients in the tin and place your mixed dried fruit in the dispenser, and in a couple of hours you will be ready to divide your dough and bake. If you decide to make these by hand.. here are two variations of recipes. Delia's and Paul Hollywood. and cover with oiled cling film until they have more-or less doubled in size. mix up a flour and water paste and pipe in crosses over your proved buns. This method of cross making is subtle and simply marks the buns rather than giving you a large prominent cross. A bit more rustic. Bake them in the oven for 15 minutes, at 220 degrees or until golden. Once out coat them in the melted apricot jam for a glistening finish. A perfect treat for an Easter breakfast.